My husband called me a little after 5:00 p.m. yesterday evening (Friday night) to tell me that “so-and-so” wanted to talk to him and, therefore, our date night would have to be a little short. Girls, my mind went haywire!! Oh, dear….what did we/he do wrong? Are they going to leave the church? Is someone mad at us? Is someone mad at one of the staff? My stomach immediately went into that yucky feeling like I could have diarrhea any minute!! I was anxious, worried, fearful. I wondered how in the world could I “fix” this!! What should I say to my husband? Bottom line--I was sinning!! As I was driving to meet my husband for an early dinner I began to pray—OUT LOUD!! I asked for Peace. For wisdom and discernment for my husband as well as for the man that wanted to talk to him. I poured out my heart to God and I am pretty sure the people who were driving next to me thought I was out of my mind!! Finally, at the end, the Lord reminded me that I cannot “fix” anything concerning this and that really there were really only two things He wanted me to do—Trust and Exalt! Ahhhh….Oh, yes, a lesson He reminds me of again and again. Trust and exalt. When things are scary and fearful and out of our hands….trust and exalt. As I began to do that, ladies, you would not believe the Peace that literally came over me. My tummy was no longer in knots. I was not anxious or fearful. I went to meet my husband and we had a great time eating before he went to meet with the man—I did not cause him any worries by sharing my fears like I had planned on doing. When he came home many hours later, he told me they had a great conversation and prayed together and I smiled and thanked Jesus! Why do I allow satan to speak lies to my mind? Why did I "assume" there was a problem? Vain imaginations—they get me every time!! Trust and Exalt!! 2 Corinthians 10:5 "Take every thought captive to the obedience of Christ!!" Do you desire to use more scripture as you train your children, grandchildren, teenagers, or even yourself for that matter? Perhaps you have tried scripture memory or simply resort to saying something like, "God's Word says not to lie!". My daughter found an amazing tool that will help us speak Truth to children in a colorful, direct and practical way. The following description is taken from their website, www.childtrainingbible.com. "This Bible is designed for parents and children to seek answers from God’s Word on common sinful problems. Topics include: disobedience, selfishness, anger, complaining and fear. 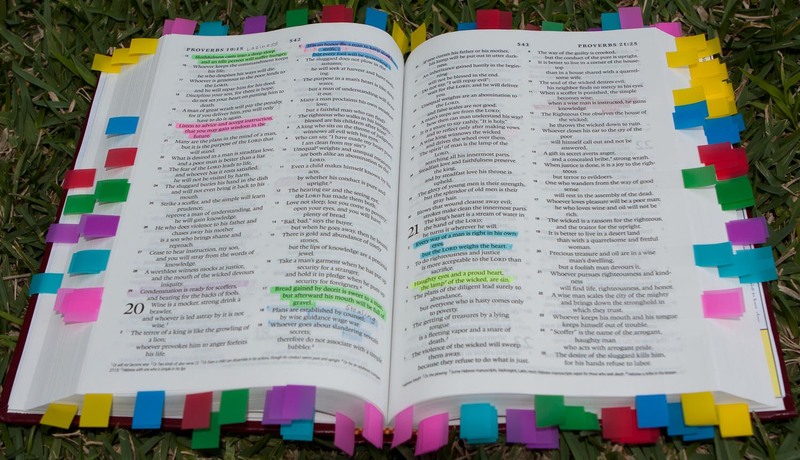 The Child Training Bible makes it easy for parents to bring the truth of God’s Word into times of instruction. Simply use the key on the inside-front cover of the CTB to locate the sinful behavior and find the section and color flags to go to. Read the highlighted verses with your child and explain what God says about the behavior that needs to be addressed. With the CTB you can make the most of your time with your children by using Scripture to instruct them in righteousness." Why not go and check it out? AND....I would also add.....adults need to go to the Word for our sinful behaviors too!! My friend, Diana Davis, is Godly, creative, smart, friendly, and honestly I could go on and on about her giftedness (humm...I am pretty sure that is not a word, but you know what it means!!) and abilities. Diana and I first became friends when our husbands were on staff together at Castle Hills First Baptist Church in San Antonio, TX. We reconnected about three years ago when we moved to Indiana where her husband served as the Executive Director for our state. Unfortunately, our crazy schedules do not allow us to get together very often (as I KNOW you all understand) but our paths do cross from time to time. Diana has written several books and lots of articles on “Fresh Ideas” that our churches can use to reach and serve and minister to people. I love reading them and wanted to share with you some things she recently wrote about how our churches can minister to new parents and their babies. You can also go to www.dianadavis.org for more information. Food ministry—there are free scheduling websites like www.mealbaby.com or www.takethemameal.com that make it easy for new moms and dads as well as those wanting to take a meal to simplify the process of having meals provided. Be sure to deliver food in disposable containers! Nursery Tour—Invite expectant parents to visit the childcare area and meet workers and parents. A wall display can list due dates so church members can pray for expectant parents. Special Delivery—A nursery volunteer visits expectant parents to answer questions, pray and be a friend. Deliver an information packet of nursery policies, training, security and notification plans. Tell how the church desires to minister to their child from birth through teen years. Meet the Moms—Invite expectant moms to attend an informal, monthly gathering of moms and their babies at someone’s home. Rocking Ministry—One church’s senior adult Bible class offers a rocking service. The volunteer simply rocks the baby while the new mom takes a long nap! New Parent’s Luncheon—A bi-annual luncheon for new and expectant parents can encourage them and help establish friendships with other new parents. Thanks Diana for these great ideas! What ideas do you all have to add to these?? Okay sisters, I do not know why with verse has been sent to me not once today but twice by two different people in two different states. Both messages were sent just following my quiet time this morning when I asked God for His strength to keep me from feeling weary and to help me understand why all these issues were hitting at the same time. My two friends did not know what I had petitioned God for this morning but He must have burdened their hearts to share the verse. This verse can easily be applied to our family stresses. I simply asked God for strength today as I will be traveling back to my parent's home this afternoon. These next few days will be stressful again and will completely wear me out. However, I do it because I love my parents and because God calls us to care for one another. Maybe you too are going through a difficult time in your family. As frustrated as I get in dealing with the issues my parents are going through, I am so thankful that I am closer and can spend these last days with my mom. So hang on girlfriend when your difficulty becomes overwhelming. I have to believe there is a light at the end of the tunnel or at least a blessing in the midst of it. Second, view this verse in terms of your ministry. Don't you get tired? Don't you get discouraged? Don't you want to throw in the towel and let someone else handle it? Unfortunately, too many ministers and their families quit and leave God's call on their lives. Oh sure, we all get weary and exhausted serving the Lord. However, the benefits of continuing His work far out weighs the affects of quitting. We must remember that everything we have done to advance His kingdom will be revealed to us in heaven. There will even be more surprises in store just from the residual affects of our work. (I know I am stretching it, but I personally believe my chocolate banquet table will have a heavenly chocolate dish that no one else has tasted except the angels). So hang on girlfriends! Don't give up! Keep on keeping on for the cause of Christ. Last week was stressful and difficult. Mom is very ill and the doctors explained to us that there is nothing else they could do. As a family we made the decision to bring Mom home with hospice care. No amount of chocolate can heal a hurting heart. As a minister's wife I am learning that I am having to play the role of minister when my husband or my parent's pastor is not there. I really do not get to be the daughter or sister. Instead, I am setting up the sitter schedule, listening to Mom give details of her wishes for her service, trying to help my dad grieve for his wife of almost 57 years, and minister to my brother, a retired Air Force colonel. Sisters, this is why we need each other. While we are walking through dark days of death or difficult situations, we need sisters to stand in the gap to pray. (I just received a Facebook message last night from a fellow sister asking that I pray for her as she is in a difficult situation). As a sisterhood we need to celebrate the joys of ministry and personal lives of each other as well. There are so many other sisters in ministry who are isolated and lonely. They have no one to vent to, cry with, or laugh with. We really need to pray for these ladies to find a connection like we have. In the meantime, I thank you for allowing me to be part of this sisterhood and for the connection we have in Christ. I love you all. (1) St. Patrick’s Day is a cultural and religious holiday that commemorates Saint Patrick (387-461 AD), the most commonly recognized of the patron saints of Ireland, and it celebrates the arrival of Christianity in Ireland. It has gradually become a celebration of Irish culture in general, and it is characterized by attending church services. (2) Saint Patrick was born in Roman Britain into a wealthy family, and both his father and grandfather were deacons in the Christian church. At the age of sixteen, he was kidnapped by Irish raiders and taken captive as a slave to Ireland. He claimed that he was told by God in a dream to flee from captivity and return to Britain. Upon his return, he quickly joined with a church and studied to be a priest. He later returned to Ireland as a bishop to bring Christianity to the Irish people, and according to Irish folklore, one of his teaching methods included using a three-leaved plant, the shamrock, to explain the Holy Trinity to the pagan Irish. Saint Patrick labored nearly thirty years as an evangelist before his death, and he has been recognized as the principal champion of Irish Christianity. (3) The day is also characterized by wearing green apparel. Interestingly, the color originally associated with Saint Patrick was blue, yet by the 19th century, green became the primary color. Also, green ribbons and shamrocks were worn in celebration of this day as early as the 17th century. I now have a new appreciation of this special day, knowing that God used Saint Patrick to introduce the Irish people to the Lord Jesus Christ. We too can be like this patron saint and be witnesses for the Lord; by the power of the Holy Spirit we can tell others about how they can have new life and purpose through a relationship with Christ. On a somewhat “lighter” note, today I want to introduce you to Gracie. Who is Gracie? She’s our 45 pound Labrador/Border Collie mix dog, and this month she celebrates her 4th birthday. It seems like only yesterday that we were bringing her home for the first time…….and then the fun really began! Don’t get me wrong, she’s not a terror; she’s really a sweetheart and oh so friendly! God has truly given us all good things to enjoy, even our furry little family members. However, she’s not pampered like some pooches; in fact, she doesn’t stay in the house....anymore. Unfortunately, a few months after she joined our family, we had to change her living arrangements. Why? As a puppy she chewed on just about everything in the house and became a major wreaking crew, so now she has a very “spacious” home in the fenced backyard. What’s really funny is that she even has a very large dog house that we purchased for her; this turned out to be a complete waste of money because she never goes in it. I guess she just loves open spaces (or maybe she’s a little claustrophobic). Some months before she joined the family, our girls begged us, “Give us a dog…Please!” But guess who takes take of Gracie…..no girls! My husband really spends more time with her than anyone; in fact, they are the best of buddies. What inspired me to talk about Gracie today was a verse I thought about, a verse I discovered one day while reading through the book of Proverbs. I had read this verse before many times, but this particular day it just jumped out at me. The verse is Proverbs 12:10a, “A righteous man cares for the needs of his animal….”. It’s amazing, but we are commanded by God to take care of our pets. I am sure that many of you dear sisters have precious pets, and you probably love them dearly; they really do become a part of the family. But the verse in Proverbs showed me that God truly has a word for us on everything, even regarding our cute little furry friends, and how gracious and kind of the Lord that He has given us these wonderful creatures to enjoy! A couple of weeks ago at our church we had a baptism ceremony, and we celebrated the occasion of five individuals who had given their lives to Jesus Christ! The youngest was eleven, and the oldest was a gentleman who received Christ when our church evangelism team went out into the community to share the Gospel! I am always thrilled to see others come into a relationship with our Savior! This baptism service got me thinking about the fact that I have two birthdays, and so do many of you. What do I mean? We all know the date when our mothers gave birth to us, the day that we made our entrance into the world. We also have a point in time when God gave us a spiritual birth, when we were born-again and entered the kingdom of light! Our physical birthday is sometimes celebrated with a little fanfare, maybe a cake, a few gifts, perhaps a dinner with friends and family. We also sometimes approach this day with mixed emotions, excited that we have been blessed to see another year, yet a little apprehensive about getting older and facing all the challenges that come with aging. What about our spiritual birthday? Is it celebrated with any type of fanfare or rejoicing? And what if you cannot remember an actual date when the Lord gave you a new life? I remember my spiritual birthday, but some do not. For those that do not remember an exact date, there is a point in time when God saves you, a time when you began a relationship with Him, and gradually started pulling away from the powerful influence of the world. Even if you cannot remember a certain date or day, but you know for certain that you have placed your faith and trust in the Lord Jesus Christ, then celebrate!! One birth brought us into this world; the other will take us on into eternity! Thank you for indulging me this week. Usually when it is my week to blog, I try to focus on one aspect or thing that I feel like the Spirit is teaching me about. This turn, however, I felt a little "all-over-the-place." I am so thankful for Lana and this blog. It is so good for me to have the accountability of this outlet. The Lord uses these weeks with their set aside times at my keyboard to help His truths sink into to my heart. Writing in my prayer journal is an important part of my spiritual growth and development. There is just something about the process that the Holy Spirit uses to speak to me. So my writings have been reflective and random. The posts didn't build on each other or really seem to go with each other at all. That is just right where I am right now. Thank you for sharing your journey with me on mine. Generational disagreements and "discussions" of worship preferences are nothing new to most Southern Baptist churches. Our church is in the midst of one such season. The "town hall" style meeting was electrically charged before the first deacon took to the microphone. Everyone seemed to be sizing up everyone else to see if they could determine what side of the issue a person was on without a word being spoken. After nearly two hours, the motion was passed to send the issue back to the deacons. A prayer was prayed. Most of us left wondering what in the world had just happened. Since then, rumors have take flight, mean words have been spoken, and misunderstandings deepened. Tears have been shed. These seasons are hard. Hard on the church and her mission. Hard on the staff as they try to focus on their jobs. Hard on their spouses who feel that they have no voice. I have sat in countless business meetings with my tongue firmly held between my teeth. I have listened to my husband's frustrations and complaints. I have heard the rumors and wrath that should never be in the hearts of the faithful, much less on their lips. These seasons drive me to my knees in prayer. I pray for kind words and a content spirit. I pray to be the encourager my husband needs. I pray for a forgiving, meek nature and a strength that is very visibly established through the Holy Spirit. I can not possess or do these things on my own. As ministers' wives we have such an important role in these seasons. While we might not feel useful or able to lead, how we handle the conflict can indeed affect the outcome. If we are Christ-filled or not, people are watching. We can be used as a peacemaker or peacekeeper. We could also fan and fuel the flames that are causing the devastation and destruction. What is it that you do? How do you handle the conflict and the division? "A Month Without Make Up" is exactly what Constance Rhodes did. Constance is an author and blogger. She tried this experiment to help support a campaign she helped to organize that "seeks to challenge the cultural views of beauty and identity to empower women to impact our world for Christ." I learned about it in last month's Home Life magazine. God taught Constance a lot over the course of her month without make up. The article was insightful and convicting to me at the same time. She was challenged even with the name, "make up." What is it supposed to "make up" for? What are we subconsciously telling ourselves when when we buy it, use it, and feel like we cannot leave the house without it. As a child, I can remember watching my older cousin put on her make up. I can't remember exactly what I said to Renee' but I remember her response, "Don't be too excited to start wearing make up, because once you start, you can never stop." Often I "joke" with my husband and girls that I need to go put on or wash off my "face" when I refer to my make up. Without realizing it, my make up has become a very real symbol of the mask that I tend to wear. Constance talked about not wearing her make up to church. Can you imagine that? What would people think? What would they say? I believe I would feel as vulnerable if I showed up without my clothes on. I am pretty sure that I would be that self-conscience. The place we should feel the best able to be ourselves and still feel love and acceptance is often not, especially when you are a minister's wife. How sad! This is so convicting to me. I really do want to be transparent, at least that is what I say I want. I just don't know if I could do it or not. I mean I think twice when I leave the house to go exercise or run into Wal Mart without my "face" on. I could run into someone I know! Now, I have also been forced to think and pray about what message I might be sending to my daughters and the teenagers I work with at church. What messages am I sending to them about self-image and self-worth? For me, it isn't about swearing the stuff off forever. It is a bigger heart issue, a perspective giver and an opportunity to take stock. God is still talking to me about this. While I am not ready to start my own "Month Without Make Up," I am not ruling out the idea either. I am still praying about it. Maybe I could go a week? I don't know. I think God could have some big lessons for me here too. Go to church without make up? What do you think? Should I try it? Would you consider it? You can learn more about Constance at truecampaign.org. Our church is a crazy place to be right now. We have multiple staff positions vacant and several being filled by an interim. One of these open positions is that of Senior Pastor. If you have read this blog for awhile, you may remember my prayer request of having an unusual appointment for a minister's wife, a position on the Pastor Search Committee. The role has been educational and humbling. The process is indeed time consuming and, at times, tedious. I have read over 300 resumes and have lost track of how many hours we have logged in meetings and in prayer. Unlike any of the other 14 members of our committee, I have direct life experience with being on the other side of this process. I know the prayers of these families that are represented on each page of every resume. I have searched the Internet to try to learn more about a potential new home for my family- houses, schools, local points of interest and just how far the place is from our extended family. I have waited and waited and waited to hear from a committee for ANY word on their potential direction from God regarding my husband and their church. I have known the seeking of the Spirit's peace and personal acceptance for whatever the Lord may have in store for us. Now, in the middle of this process, I know the pressure and the heavy weight of being on a committee such as this. Every committee at every church is different, but as Christians seeking God's will for our beloved church families, I am constantly in prayer knowing that the results of our work will have an eternal impact on so many. Like many other decisions in my life I am wanting God to audibly speak so we will know that we are headed in the right direction. We are praying for clean hands and pure hearts as individuals on the committee and for unity in the Spirit as an entire group. I am in a VERY unique position. Are you in a position of waiting on the Lord's leading regarding your husband's church employment? If you could address the committee considering your man, what would you tell them? What would you want them to know? What would you want to know from them? I would be happy to pass on your feelings and insights to our committee. And while I cannot speak for any other committee of our church or any other, I would be happy to respond to any questions or concerns you may have regarding the process we Southern Baptists tend to take in the searching and hiring of new staff members. Again, I covet your prayers and want you to know that those of you who are seeking God's future ministry for your family, are most definitely in mine. My picture and name have been in the upper right hand corner of a page or so document that was supposed to represent a long journey with our Lord too. Recently, I read a blog written by a frazzled mom who had finally had enough of older "mothers" and complete strangers telling her to treasure these days because they are fleeting. Not that she didn't appreciate the good intentions of these people, but I totally understood and could sympathise with the author, that some days are hard and you feel ready for life's next phase. I am so ready to stop buying diapers. Third grade math isn't as easy as it used to be. Have you seen my husband's spring/summer calendar?! My to-do list only grows and I can't seem to get caught up on the laundry, the grocery shopping or the house work. It is easy to wish days away. The author's purpose wasn't to complain or host a pity party. Actually, I was quite encouraged by her reason for writing. She honestly pointed out that sometimes it is hard to have whole days that we want to "treasure" and remember forever in the midst of our busy, hectic, crazy lives. Instead, she prays for and seeks out much smaller portions of time to treasure. Personally, I struggle with my own expectations of myself. If I want to treasure a special day, I put it into overdrive trying to accomplish the "perfect" day. As a result, I wear out myself, my husband and my girls. The day will become memorable all right, just for all the wrong reasons. Like the author, I have become intentional to savor some thing everyday. This morning, I knew it was going to be a busy hectic day, so when my girls interrupted my quiet time, I took advantage of the still house to just hold them. I studied their faces and prayed, thanking God for each of them and these few precious moments of peace. I accepted then and there that we might be a little late running out the door, but it was really worth it. Yesterday, it was the sweet position in which Piper fell asleep in her bed for her Sunday Siesta. Saturday, it was the cute way the girls played together in the floor. Friday I enjoyed curling Riley's hair for a special event at school. I am not writing these moments down anywhere. I don't know, maybe I should. They are just ordinary moments, mental snapshots of what life in the Vinson house is all about. But, I am praying for open eyes and an awareness to help me to be intentional to remember these small details and to praise God for His goodness in these blessings. With this attitude I found so many things that I was looking at as "have to" are now "get to." I am more appreciative to God and very aware of how very good He is. These busy days are still busy, but I feel like I am living life to the full as He intended instead of just feeling that my life is too full. I am finding God in the best places all through my day too. How about you? What is a special moment that you want to treasure? How do you make sure that you are soaking up the gift that God has given you in today? The shortest verse in scripture consists of only two words, “Jesus wept.” This profound and powerful verse makes us want to know why He wept and then wonder if we weep over the same things. A few days ago another short verse (this one has only three words) hit me hard. Jesus spoke these three simple, yet powerful, words in Luke 17:32, “Remember Lot’s wife.” What? Why has this never hit me before? For sure...I have read that verse before. But I guess each time that I did I ran past it on to other things—or ignored it. I am pretty sure I have not obeyed it. “Remember Lot’s wife”? Why? There is not even a mention of her name anywhere in scripture. She is only referred to as “Lot’s wife”. Remember her? I don’t even know her!! So I decided it was about time that I did know her. What was I to remember about her? Honestly, I can’t think of a single positive thing I have ever heard about her. Have you ever heard anything nice said about her? She had a great beginning to her marriage—she had a close association with Godly people—she and Lot were close to Abraham and Sarah. She and Lot chose to leave what they knew and go with Abraham to an unknown land. But when she and Lot settled in Sodom, she got sucked in to the mess that was there. She made friends, accumulated stuff, got comfortable with the chaos. Before she knew it she had become accustomed to her surroundings and in her passion for possessions—she lost it all. Dana, remember Lot's wife! Don't get comfortable with your surroundings! Don't get accustomed to your possessions! Because of the unbelievable grace of God the angels came to rescue Lot and his family from destruction. He came to literally pull them out of the mess and chaos. The angel took her hand and urged her out and was very specific when he told them to not look back. She did not obey and we all know she looked back and her pillar of salt is a monumental warning for us today to not look back! Dana, look longingly forward toward salvation and freedom and refuse to look back at what was or what could have been or what might have been. Remember Lot’s wife!! Hear the Lord saying, "I have rescued you! Don’t stop! Don’t look back! Don’t long for what was or for what you used to have or for what your life used to be like. Take my hand and walk with me to safety! !” The escape route for us is clear! It is Jesus! Follow Him without hesitation!